The chewable all-natural bacon flavored tablet is highly palatable to dogs and cats, so much so that they can even be used as treats. 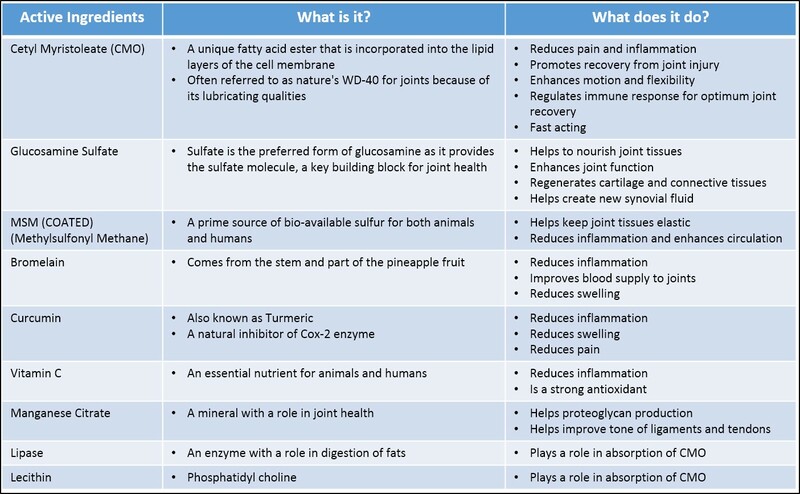 Some competitors' joint formulas omit MSM from their products because dogs, in particular, do not like its taste. 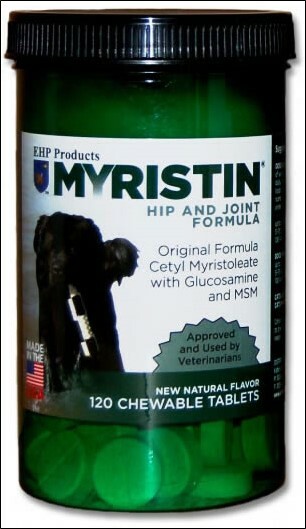 The MSM in Myristin® Hip & Joint Formula for Pets is coated, so there is no taste to it and no need for excessive flavorings. This makes it far easier to administer MSM and helps to make it affordable. Need help determining what size bottle to order? The 120 count bottle contains a quantity of tablets appropriate for a loading dose for small dogs, cats, and other small animals. The 240 count bottle is preferable for customers with multiple dogs, customers with large dogs, dog breeders, and customers with dogs on maintenance doses. Best given at the time of a regular daily feeding. Tablets can be given half in the AM and half in the PM. Tablets may be crushed for very small animals. If desired, the tablets may be given as a treat on an empty stomach an hour before feeding with water available. Consider consulting with your veterinarian before giving to breeding or pregnant animals. If tablets are not eaten readily, crush and add to food. Give one tablet per day per 25 pounds of weight for two months (see chart below). Older animals may need to be given the loading amount for longer than two months. Recommended maintenance amounts are one-half of the loading amounts (see chart below). Give 1 tablet daily for 60 days. Tablet may need to be crushed and given on food. Are there any side effects when giving Myristin? There are no side effects associated with this nutraceutical supplement and it is safe for dogs and cats. Please ask a veterinarian about suitability and dosage before giving to other animals. Important: Keep out of reach of children. In case of accidental overdose in a human or animal, contact the appropriate healthcare professional. Click the icon to read more about Myristin and EHP Products.